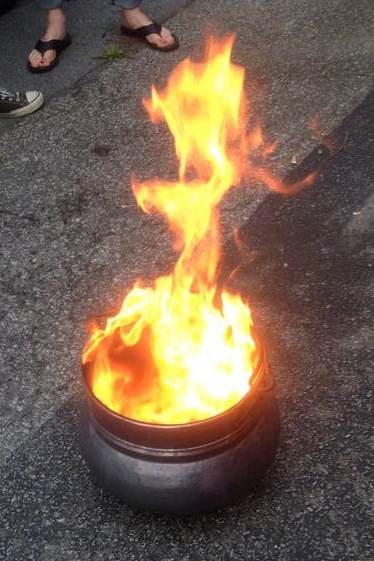 As the copper cauldron heated up, a fantastical chemical reaction happened wherein the flames turned green! It was the witchiest thing we’ve had spontaneously happen in a long while and it was glorious in its simplicity. This was an impromptu ritual because our dear Tribe member, who intended to host and lead our Litha ritual, lost his father earlier in the week. Death is not only an ending, it is a beginning, just as Litha is both the triumph of the sun, and the beginning of decline into the dark half of the year. We’ve had a lot of death visit us this midsummer with several people known and kin to folks in our group crossing the veil, which is a fitting reminder that death ALWAYS hangs in the balance with life. All the more reason to savor the joys and bounties when they come, for tomorrow we may die… This summer season, I am overjoyed to travel to see my family in my mother’s home town for the first time in many years. That is my celebration of life, as I honor the life of my maternal grandmother, who passed through the veil at Beltane. Back at Beltane, My grandmother Frances came to visit me before they even laid her body to rest. As my daughter and I toured a historical church yard with cemetery in New Bern, NC, (because that’s what my 12 year old daughter likes to do for her birthday, Witchy much?) who should join us in that cemetery? Only the spirits of our maternal ancestors, and they spoke to us via a medium from New Jersey named Denise who was touring the same churchyard, and was kind enough to deliver their messages. 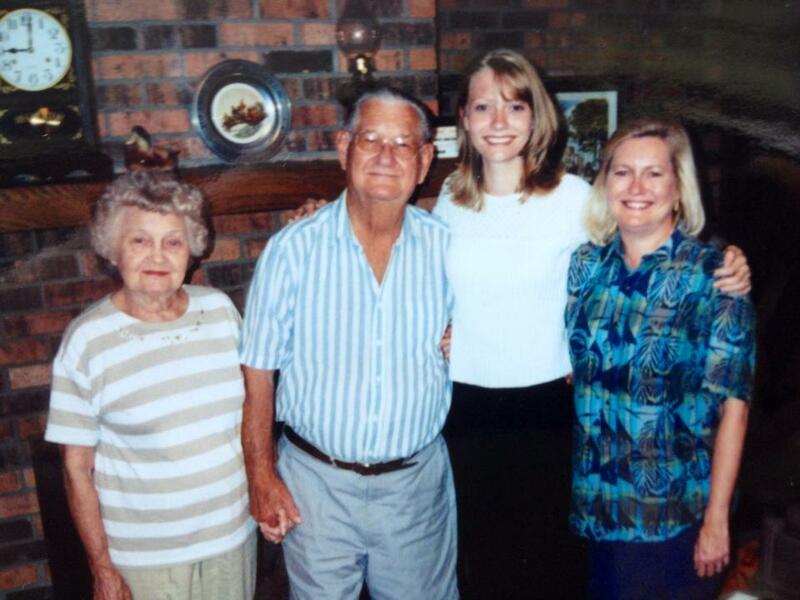 left to right, Frances, Elmore, me and Sondra Rouse, circa 1998. Yes, Frances and Elmore, my grandparents divided by the veil for almost 15 years, and Sondra, their daughter and my mother, gone these last 7 years, were with us once more. Their family is rejoined in Spirit at last and looking out for us. They came to tell me that they think I’m a great mom, that they they love us, are proud of us, and not to worry about them because they are just fine, the afterlife is better than they even expected. Denise transmitted their side of the story of what was going on after my grandmother became so sick that she was mostly incoherent. Her family in Spirit became a kind of hospice care on the Spirit side, while my Aunt, Uncle and Cousins, were attending her on the living side. Her Spirit family helped her to relax, let go, and ease across the veil to rejoin them. Her father was even present there in the end, keeping watch over her. That tidbit gives me great comfort. You see, they were all Christians, and the afterlife just isn’t what they were told it would be, but it is better, and they wanted me to know that they accept me fully for who I am–the Witch in the family. I’d kept that last bit from all three of them while they were alive. It was toe-curling awesome to be fully known by them at last. My granddad told my daughter that he looks out for her especially, that “she’s his girl.” That thrilled her to no end, especially since he died several years before she was even born. If you are going to have an ancestral guardian, make it Granddad Stormy, former police officer! I stand in awe and wonder of my magickal life. Gratitude. For those of you in the Southern Hemisphere who visited my blog last week, Merry Winter Solstice! I wish you all the joys of the new light! As we head into the darkness, you are heading into the light. Isn’t that a beautiful balance? I love how the Wheel of the Year is so relative to where you live. This entry was posted in Life, Sabbats and tagged Litha, Modern Witchcraft, sabbat, spirituality, Wheel of the Year, Wicca, wiccan, Witchcraft, Yule by Heron's Rook. Bookmark the permalink.